The diagnostic yield of prebronchoscopic sputum, bronchial aspirate and postbronchoscopic sputum cytology was assessed in a total 60 proved cases of lung tumours. The prebronchoscopic sputum examination for malignant cells yielded an overall positivity in 11.66%, bronchial aspirate in 26.66% and postbronchoscopic sputum in 15.00% cases. One case was diagnosed solely by prebronchoscopic sputum, two cases solely by bronchial aspirate and one patient solely by postbronchoscopic sputum examination. In one patient, both bronchial aspirate and postbronchoscopic sputum were positive and forceps biopsy yielded negative results. Thus, these sampling techniques, although less sensitive, are complementary to each other and are likely to enhance the total diagnostic yield. Twenty-five diabetic and 50 non-diabetic pulmonary tuberculosis patients were treated with six months short course chemotherepy (2 SHRZ/4 HR). Clinical, radiological and bacteriological course was almost similar in both the groups. The sputum conversion was achieved in 92 per cent non-diabetics and 78 per cent diabetics at the end of third month and all the smears were negative for acid-fast bacilli from fourth month onwards in non-diabetics and fifth month onwards in diabetics. The response of six month short course chemotherapy in diabetic tuberculosis has been excellent in all respects as compared to the non-diabetic tuberculosis patients, provided the diabetes is promptly controlled with effective drugs, including insulin. Longer follow up is required to detect relapses. 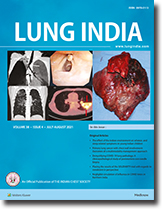 Trasnthoracic Fine Needle Aspiration (TFNA) was done in 62 suspected cases of sputum negative pulmonary tuberculosis. According to material obtained form the procedure, the aspirates were divided into four groups, (i) tuberculosis confirmed by direct smear and/or culture (n=27.43.55%), (ii) suggestive of tuberculosis by cytology (n=18,29.03%), (iii) other diseases (n=3,4.84%), (iv) inconclusive (n=14,22.58%). Sputum cultures for Mycobacterium tuberculosis were positive in eight (12.90%) patients. However, 27 (43.55%) were confirmed bacteriologically by TFNA direct smear for acid fast bacilli and /or culture for Mycobacterium tuberculosis (p<0.001). The diagnostic yield of TFNA was significantly more in the lesions with radiological opacities < 4 cm in diameter (p<0.05). Complications were rare, self-limiting and required no active management. TFNA has a place in the diagnosis of suspected pulmonary tuberculosis when more simple methods have failed. 100 consecutive patients with cervical lymphadenitis were studied by clinical, bacteriological, histopathological and cytological methods. Taking histological examination as reliable diagnostic criterion, 64.0 per cent were found to be tuberculous, 9.0 per cent chronic nonspecific laymphadenitis, 11.0 per cent reactive hyperplasia, 4.0 per cent acute infective lymphadenitis, 3.0 per cent sinus histioytosis, 2.0 per cent lymphoma, and 7.0 per cent metastatic lymphadenitis. On FNAC, 81.2 per cent of tuberculous, 74.0 per cent nonspecific and 88.0 per cent of malignant lymphadenitis cases could be correctly diagnosed. However, the procedure was associated with an overdiagnosis of reactive hyperplasia and chronic nonspecific lymphdenitis in 70 and 70.6 per cent cases respectively. FNAC proves to be a satisfactory tool in the diagnosis of cervical lymphdenitis. The procedure is simple, safe, repeatable, and inexpensive and can be recommended on outpatient basis even in peripheral hospitals and dispensaries. However, histopathological examination is required for definitive confirmation in patients of reactive hyperplasia and chronic nonspecific lymphadenitis diagnosed by FNAC. Methyl isocyanate (MIC) caused the worst Industrial Chemical Disaster in history. Many experimental studies were carried out in rats and guinea pigs to assess the toxicity. The experiments are reviewed in the light of reported acute (Short term) effects. The long term effects of methyl isocyanate on various parameters of health in small animals are reviewed. The immediate changes in large animals (goats and buffaloes) are also analysed. Two cases with co-existent pulmonary tuberculosis and leprosy are reported. An association between the two disease has been discussed. A case of preimembranous ventricular septal defect which presented as persistent respiratory distress due to anatomical obstruction of the left main bronchus by enlarged left pulmonary artery is reported. Spontaneous pneumomediastinum associated with acute renal failure is rare. A case is reported with review of literature.